Hundreds of women workers are taking part in longest ever running strike in the Katunayake Investment Promotion Zone, Sri Lanka. Workers from workwear manufacturing company ATG Ceylon Pvt Ltd. in Sri Lanka have been subject to a range of human rights abuses breaching both Sri Lankan and international labour laws and conventions. Hundreds of women workers, part of the Free Trade Zone and General Services Employees’ Union (FTZ-GSEU) have been on strike for over two months. Two workers are also on hunger strike. In March, Labour Behind the Label and War on Want handed in the petition to the Sri Lankan government at the Sri Lankan High Commission in London, calling on them to take urgent action. Partnering with global union IndustriALL, campaigners gathered over 6,000 petition signatures in five days. The strike was prompted when the company illegally dismissed five workers and union members in January 2019, and allegations around violent and sexual harassment against a woman worker who was pressurised to leave both the strike and the union. This is not the first time concerns have been raised about ATG Ceylon Pvt Ltd lack of respect for Sri Lankan law and workers’ rights, and we urge the Sri Lankan government to take immediate action. 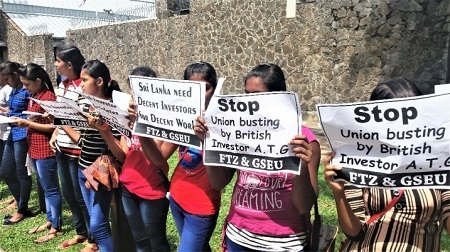 Over 6000 people have already signed a petition in solidarity with workers at ATG Ceylon Pvt Ltd. in Sri Lanka but workers need our ongoing support. Will you sign the petition today to stand alongside them? NB. this petition is hosted by War on Want and you will be directed away from our site.